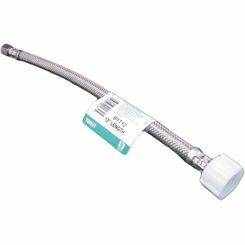 With the widest selection of discount plumbing products available online, PlumbersStock offers the best savings when you need a toilet supply lines. We encourage you to buy in bulk for the best deal because you can save on shipping, but purchasing just one is very affordable and saves you a trip to the hardware store. 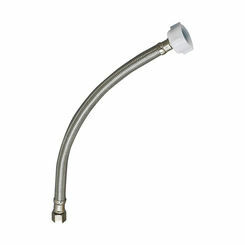 Save on Fluidmaster and other great brands of toilet supply lines here at PlumbersStock. 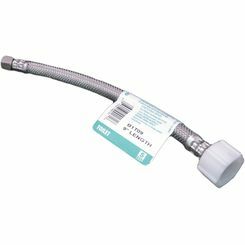 What Is a Toilet Supply Line? In order for the flush mechanism on a toilet to function, there must be water to fill the tank. A variety of supply lines can be used to fulfill this role. 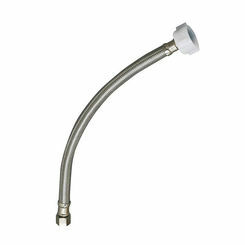 Typically they are 3/8” in diameter, but toilet supply line size can vary in length, usually anywhere from 9” to 20”.  Measure for accuracy to ensure you are buying a part that will match your installation. A flexible line is ideal because its pliability allows you to bend the part as needed. 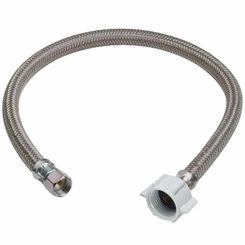 PlumbersStock offers you your choice of stainless steel, chrome, and PEX toilet supply lines. PEX is the inexpensive solution. It is easy to cut, easy to install, but does not look very nice. It must be cut to the proper length but the advantage is that it does not kink quite as easily. 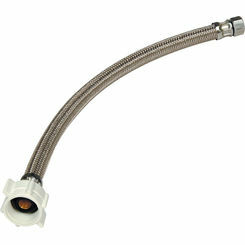 Chrome supply lines look the best but are difficult to install because the can kink easily. They also must be cut to length, which can create problems because a common mistake is to cut it too short. Remember you can always cut more off, but you cannot restore what you have cut. Flexible stainless steel lines: come in variable lengths. You do not cut them to fit, but you can buy them a little long and they will bend conveniently to fit just right. 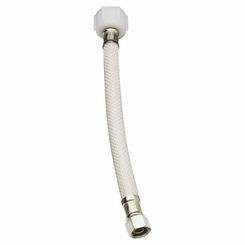 These are the easiest to install, and offer a better look than the PEX. Shut off the supply of water to your toilet, and in almost all cases this is done by turning the valve clockwise. 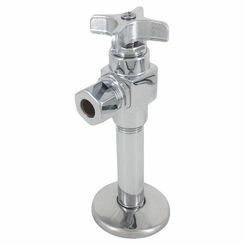 Remove water from the tank by flushing the toilet as necessary, and then cleaning out the remaining water with a towel. We recommend you place an old towel on the ground underneath the tank. 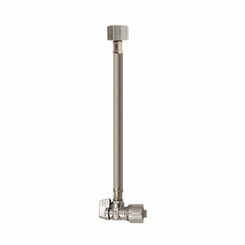 Disconnect the line from the supply valve and then disconnect from the fill valve (usually on the underside of the tank). By hand, connect the new line to both the supply valve and the toilet. Once the line is secure, go the extra mile and tighten it with a tool (a wrench is ideal, but a number of tools work. Now you are ready to turn the water back on and check for leaks. Congratulations! 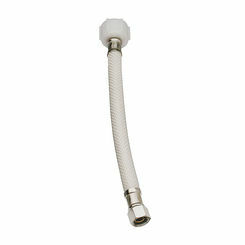 No more headaches from a leaking supply line. 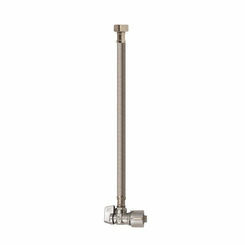 If you are still seeing a leak, most likely, the nuts on connecting the supply line to the fill valve and supply valve are not tight enough. You might need to apply more “elbow grease” or get a heavier-duty wrench, but that should not be necessary. 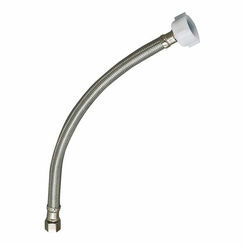 Installing a toilet water supply line is an easy “notch” on your home improvement “belt”. With the best prices on the web, and unbeatable service, it is no wonder so many turn to PlumbersStock for plumbing, HVAC, and sprinkler supply. 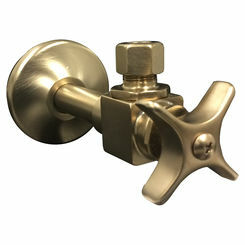 The thousands of tools, fixtures, and parts we offer ensure that we have you covered for your home improvement project. 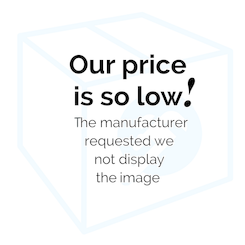 If you have any trouble locating the right part for your project, or if you have questions about shipping options, or our return policy, feel free to contact our team of customer service professionals. They are happy to help you with your purchase and can address any inquiries or concerns. 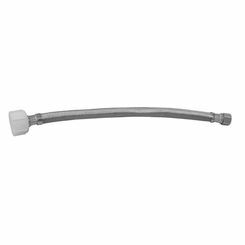 Choose PlumbersStock for discount toilet water supply lines, and all the other products you need to get your bathroom operating at full efficiency.